A combined concert at Hope College by the Wind Ensemble and College Chorus will feature a variety of works by multiple composers, including John Rutter’s “Requiem” and the world premiere of a major piece by a Hope student. The concert will take place on Tuesday, April 22, at 7:30 p.m. in Dimnent Memorial Chapel. The concert is in two parts. 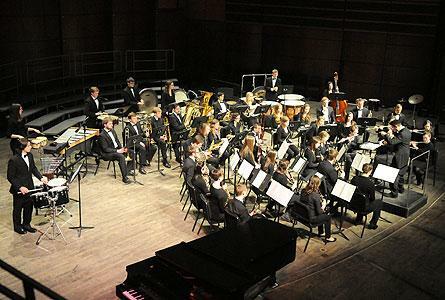 The opening portion of the concert will be performed by the Wind Ensemble under the leadership of Dr. Gabe Southard. The Wind Ensemble will perform a variety of traditional and contemporary wind band literature, featuring works by Florent Schmitt, John Stevens, and Joaquin Rodrigo, as well as the world premiere of “The Frontier” by Hope sophomore Colin Rensch of Kalamazoo. “The Frontier” is a major work for full band, and is in three movements: “Discovery,” “Promised Land” and “To the Sea.” Rensch, who is a composition student of faculty member Steve Talaga, wrote the first movement while a senior in high school and the second and third movements this year at Hope. He is a music and history major, and participant in the college’s Mellon Scholars Program in the arts and humanities, whose activities at the college have also included the Jazz Ensemble and the Student Activities Committee. Rensch is a 2012 graduate of Mattawan High School, and the son of Dr. Robert and Janice Rensch of Kalamazoo. Following the Wind Ensemble’s performance, the College Chorus, under the direction of Gary Bogle, will perform the “Requiem” of John Rutter. The “Requiem” will display the talents of more 100 college and community singers. The singers will collaborate with an instrumental ensemble, including members of the Wind Ensemble and area musicians, on flute, oboe, cello, timpani, glockenspiel, harp and organ. Soprano soloist Diane Penning will be featured in two movements of the work. Seventy-four Hope College seniors have been awarded monogrammed blankets for their participation in athletics at Hope. Eleven Hope College student-athletes and two Hope teams shared top honors at the fourth-annual HOPEYs awards ceremony Monday night.